Dr. Jennifer Mindell is Reader in Public Health at University College London. A public health physician with experience in epidemiological research, teaching, general practice, and health promotion, she has a major interest in policies that affect determinants of health and inequalities. She leads the UCL team dealing with the Health Survey for England. 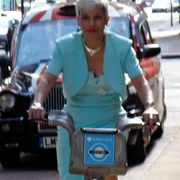 She is the principal investigator for a multidisciplinary, cross-research council project at UCL, Street Mobility, to develop tools to measure community severance. 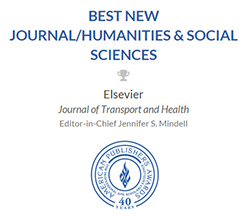 The Journal of Transport & Health is very new: Dr Mindell is the inaugural Editor-in-Chief. It won the 2016 Prose Award for the Best New Journal in Humanities & Social Sciences. What does being a journal editor mean to you and what do you find most rewarding about this role? Being a journal editor means professional recognition of my work in this area. The most rewarding aspect of this role is providing a peer-reviewed outlet for work that encompasses the interactions between transport and health, together with increasing resources to which to refer people who think transport and health means the health of transport workers! 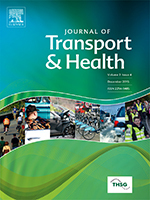 What are your biggest challenges as editor of Journal of Transport & Health? How do you overcome these challenges and what extra support can Elsevier provide? The biggest challenges are time (mine, that of the associate and guest editors, and reviewers’) and finding suitable reviewers. For the former, I need to be disciplined, organized, and be able to delegate. But that requires having someone to whom I can delegate. I pay a PhD student to do most of the administrative work, leaving me to deal with the decision-making and the tasks that require experience and/or expert knowledge. More funding from Elsevier would allow more support for me and also for the associate editors, who are also very obliging and will cover my role if I will be out of contact for more than a few days. In many areas of research, the growth of paper submissions is outpacing the growth of qualified reviewers and resulting in pressure on the peer-review system. What do you think the solution to this problem is and how do you see the peer-review process changing in the future? Finding reviewers who are knowledgeable about the topic, and are willing and able to review within a short time frame is difficult, especially for a new journal. Improvements to EES have made it easier to search Elsevier’s wider databases for potential reviewers but the biggest increase in reviewers suggested for a given manuscript has been from going through all the reviewers’ records and ascribing ‘personal classifications’ to them – either by emailing them and asking them to do so, or from internet searches. It would be great if Elsevier could do that routinely when someone registers, or is registered as a reviewer, rather than relying on me paying someone to do that for us. As a cross-disciplinary journal, we would like to have at least one reviewer from a transport background and one from a health background for each article but unless we do not use the ‘alternate reviewer’ promotion facility, this is not possible. It would be possible if Elsevier’s system allowed us to classify people by discipline as well as by topic interest, and only proposed reviewers from the same discipline could be promoted if an invited reviewer declines or is uninvited because of not responding. We have observed that researchers are increasingly accessing journal content online at an article level, i.e. the researcher digests content more frequently on an article basis rather than a journal basis. How do you think this affects the visibility of your journal among authors? I don’t think it affects the visibility of our journal, except for potential readers not finding our articles if they use electronic databases that don’t (yet) include Journal of Transport & Health. If researchers accessed the journal by using printed issues, they would find additional articles that might be of interest but either they would need to know it existed to look at it, or their library would need to be displaying it for it to be noticed. However, I prefer to browse printed journals as online searching tends to limit one to reading articles on predetermined topics for which I’m seeking information, rather than reading what I should perhaps know or would be interested to read. Academic publishing is increasingly embracing open access. How do you see these open access changes in your country? And how do you see them affecting authors who publish in your journal? In the UK, the requirements of research funders and of those assessing the quality of research in academic institutions (which determines governmental funding), require articles to be deposited in institutional repositories within three months of acceptance. A recent conference on open access suggested a number of innovative ways to fund it, through pooling resources and perhaps redirecting libraries’ funds for subscriptions but whether those would work for commercial publishers I am unsure. At the moment, it is relatively easy for authors at prestigious universities to arrange for open access funding but harder for those in less research-intensive institutions or in local government and other organisations, particularly where the fees are high. Authors without funding for publication are going to restrict their submissions to journals that do not charge them, which is good for our journal as open access is optional, rather than sending them to journals with automatic page charges or other publication fees. Researchers need to demonstrate their research impact, and they are increasingly under pressure to publish articles in journals with high Impact Factors. How important is a journal’s Impact Factor to you, and do you see any developments in your community regarding other research quality measurements? As mentioned in the introduction, Journal of Transport & Health cannot yet have an Impact Factor. I know that this is a deciding factor for many researchers and potential authors but more people are influenced by the relevance of this journal to their research and the suitability of the readers they are trying to target. The three key disadvantages of journal Impact Factors are that they reflect a journal overall, not a particular article (which may have had little impact); that they are affected by the size of the pool of researchers in that topic; and they do not reflect impact on practice. For example, because of the volume of research papers published in that field, a low-ranked cardiology journal may have a higher Impact Factor than the top international social sciences, transport, or public health journal. This is also affected by the length of the publication cycle, with social sciences papers taking longer to write and publish, and therefore to cite and be cited, often falling outside the two-year IF citation window. Additionally, the Impact Factor - and individual articles’ citation rates - reflect citation by other researchers, not the article’s use by policy-makers. Individual metrics (page views, downloads, and citations) are probably more important, although there are problems in assessing this routinely if articles are available in multiple locations, such as the journal, on an institutional website, and on one or more online fora for researchers. And a very highly cited article could be terrible, being cited as an example of what not to do. My preferred options are first, field-specific Impact Factors for journals (such as the ERA system from Australia, now discarded because of the difficulties of making such judgements) that rate the importance of each relevant journal in that research field, although I’m not sure how that would work for a cross-disciplinary journal such as Journal of Transport & Health. Secondly, I think those assessing research outputs will increasingly use article-based rather than journal-based metrics but we need a way of tracking how research influences policy. That said, research builds on what has gone before and the final article that is mentioned by policy-makers or practitioners will generally have relied heavily on previously accumulated knowledge. Finally, unless we have evidence-based rather than conviction-based or interest-based policy-making it would be unfair to penalize researchers whose scientific conclusions do not fit with the political zeitgeist. As online publishing techniques develop, the traditional format of the online scientific article will change. At Elsevier, we are experimenting with new online content features and functionality. Which improvements/changes would you, as an editor, find most important? If I am searching the literature, the online databases and ability to use Boolean search terms (and, or, etc) greatly increases the sensitivity and specificity of searches, covering far more literature than would be possible otherwise. Being able then to access these through UCL’s online library means that most of the relevant articles I find are at my fingertips. In general, as I prefer reading printed material, I would generally print what I find. (Interestingly, a study has shown that eyes track text differently on screens and when printed, and that printed text is more likely to be retained). However, I like the feel of books (I don’t have an e-book reader) and the look of filled bookshelves. I like being attracted into non-searched-for articles that you find when flicking through a printed journal to locate a specific article. And I only read (or at least look at) all the articles in an issue if I have a printed volume, particularly as I can then read it in places I don’t have computer access (and I don’t want to read on tiny phone screens). I have therefore had to subscribe to the printed journal myself. There are two huge advantages with online articles. One is the ability to publish supplementary material that enhances the manuscript but with more detail than most readers would want, also putting this material into the public domain. The other is the speed with which an accepted article can be published, without having to wait for the next issue, or for some journals, the next issue with sufficient space. (Journal of Transport & Health currently has no maximum size per issue so can print as many articles as I want but some journals have up to a year’s wait for full publication). Regarding new developments, I’m rather traditional (perhaps because of my age(!)) and am generally a late adopter, needing to be convinced or shown the benefits. A submission system that is as user-friendly for the reviewers and editors as it is for the authors would be my top priority. Do you use social media or online professional networking in your role as an editor or researcher? Has it helped you and, if so, how? I use both Twitter and electronic professional networks to alert people to publication of Journal of Transport & Health issues, calls for articles for special issues in the journal and conference abstract calls. I also use Twitter to disseminate my research findings when published. How do you see your journal developing over the next 10 years? Do you see major shifts in the use of journals in the future? As a new journal, it is still evolving. Time will tell what the balance will be between general issues and special, topic-based issues (three general issues to one special issue in volumes 1 and 2, but maybe more special issues in future). Academics will still need to disseminate their work through peer-reviewed sources. I should like the journal to fulfil that role but to do so in a way that is also useful for practitioners, to help get research findings into policy and practice. We are currently discussing whether it is appropriate for a scientific journal to include a section for and/or by practitioners, and if so, what form it should take. Do you have any tips or tricks to share with your fellow editors about being a journal editor?